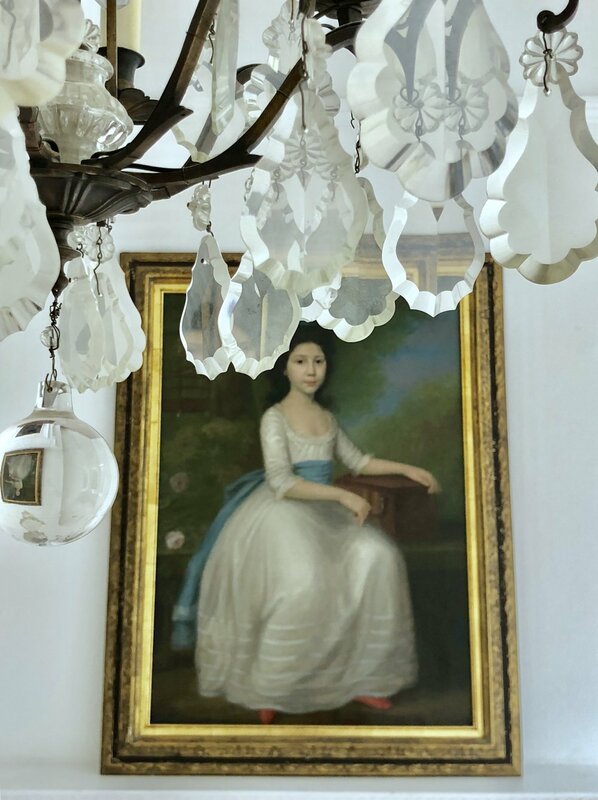 Late 18th century portrait of a girl in a white dress with finch and music box, housed in a mellow gold antique carved frame. A particularly fine, large and highly decorative late eighteenth century portrait of an attractive young girl in a flower strewn garden. The sitter wears a full skirted white dress with blue sash and a pair of scarlet silk shoes. She is perched under a tree upon a stone ledge and plays a music box with a caged finch for company. This particular combination of pleasing elements. mean that it is easy to interpret this portrait as an allegory of music! 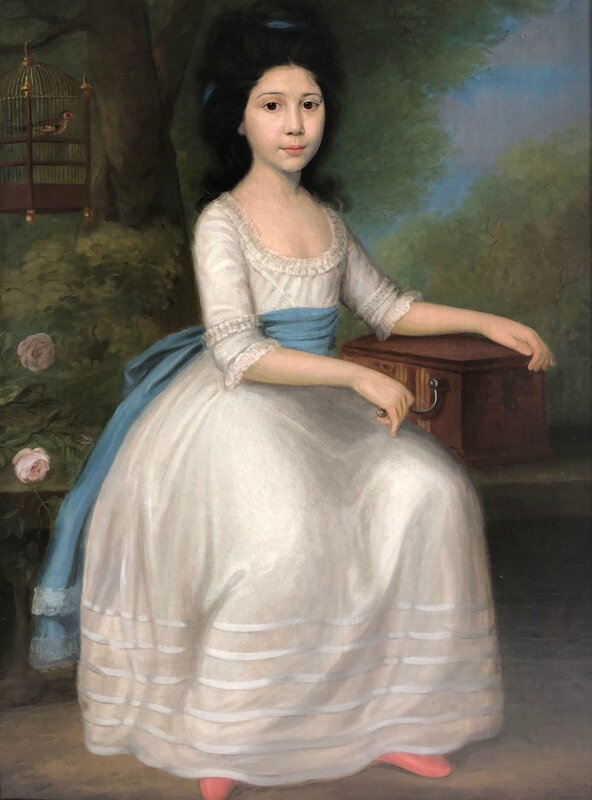 18TH CENTURY PORTRAIT OF A GIRL WITH A FINCH AND MUSIC BOX - CIRCLE OF THOMAS BEACH. Thomas Beach (1738-1806) Was an English portrait painter that studied under Sir Joshua Reynolds. Beach was born at Milton Abbas, Dorset in 1738, and showed. a strong predilection for art from an early age. In 1760, under the patronage of Lord Dorchester's family, he became a pupil of Sir Joshua Reynolds, while at the same time studying at the St. Martin's Lane Academy. He then settled at the fashionable resort of Bath, where he was much in demand for his portraits and portrait groups, which were usually of a small size. He painted the actress Sarah Siddons several times. In his first portrait of her, painted in the winter of 1781–2, she is shown seated, in everyday clothes, holding a book. He depicted her again later in 1782, in one of his more ambitious works, an allegorical portrait inspired by Milton's Il Penseroso, in which she represented the personification of Melancholy. He was a member of the Incorporated Society of Artists, and a contributor to its exhibitions from 1772 to 1783. He exhibited the Royal Academy every year from 1785 until 1790, but not again until 1797, when he was living at Strand-on-the-Green, near Kew in London, and sent a portrait of the Prince of Wales. Several of Beach's portraits were engraved in mezzotint by William Dickinson, Valentine Green, Richard Houston, and John Jones. Beach died at Dorchester, Dorset, on 17 December 1806.